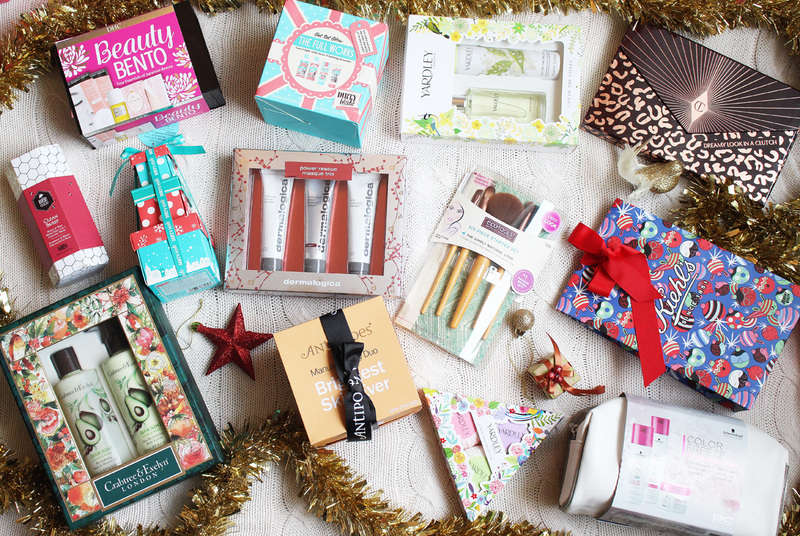 Continuing the gift set series, today we have some fantastic options for beauty addicts. From skincare, body care and haircare, to tools and makeup. Now let's get started! This adorable Beauty Bento Box by DHC*(£13.00) is such a great idea! 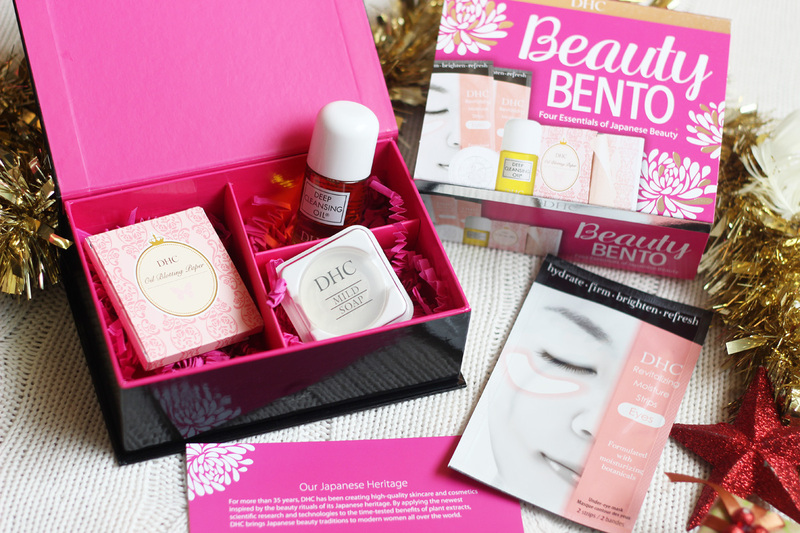 I love DHC and I always recommend their Cleansing Oil to everyone, so this little selection would be a fab gift for someone who's not familiar with the brand or a DHC enthusiast who would appreciate the beauty of this Bento Box. For £13.00, you get a mini Iconic Deep Cleansing Oil, a mini Ultra-nourishing Mild Soap, two packs of the Revitalising Moisture Eye Strips (only one pack pictured, as I used one before taking the photos) and their cult 100% Natural Blotting Paper. 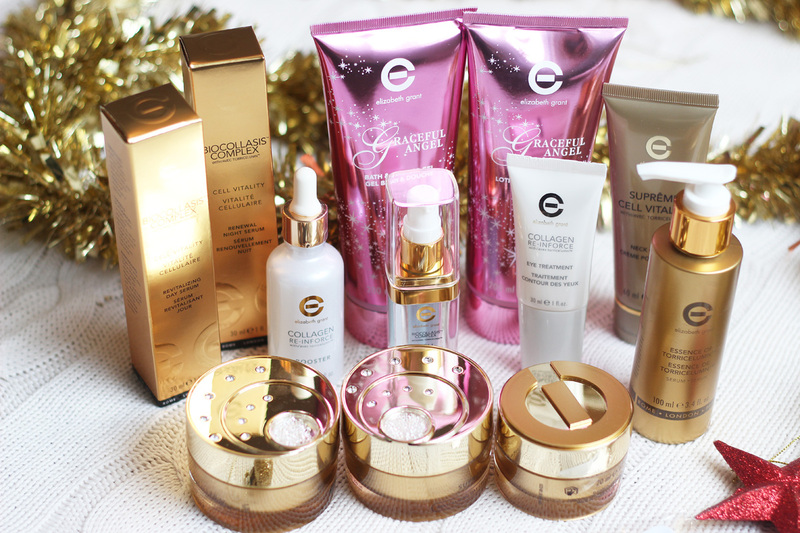 Next, we have this fantastic Elizabeth Grant 12 Piece Bumper Skincare Collection*(£69.99). Ideal for those who need a full new skincare regime, or those who want to get a variety of items to gift as stocking fillers at a really good price. I love the Elizabeth Grant packaging, it's so fancy! The set includes the following items: Graceful Angel Body Lotion - 200ml & Graceful Angel Bath & Shower Gel - 200ml, Supreme Cell Vitality Neck Cream - 60ml, Essence of Torricelumin Serum - 100ml, Collagen Re-Inforce Booster - 45ml, Collagen Re-Inforce Eye Treatment - 30ml, Biocollasis Complex Renewal Night Serum - 30ml, Biocollasis Complex Revitalising Day Serum - 30ml, Biocollasis Complex Victory Eye Serum - 15ml, Cell Vitality Revitalising Day Cream - 50ml, Cell Vitality Renewal Night Cream - 50ml and a Cell Vitality Flawless Eye Balm - 20ml. That's a lot of fab skincare goodies for only £69.99. For makeup addicts, you simply can't go wrong with this stunning Dreamy Look In A Clutch by Charlotte Tilbury*(£90.00). I wrote about it on a separate blog post, which you can read here. So, so beautiful! 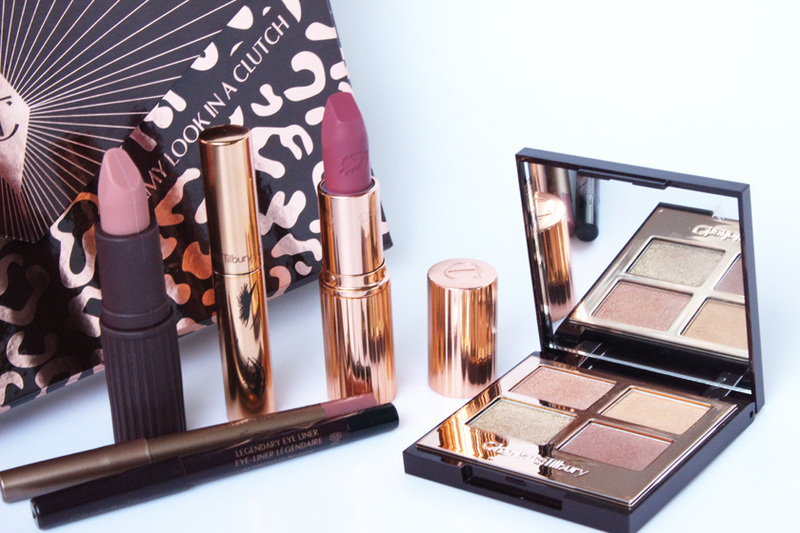 I can't get enough of Charlotte Tilbury products! Makeup brushes are actually an amazing idea, if you know that the person you're buying for loves makeup, but you're not sure what to get them. 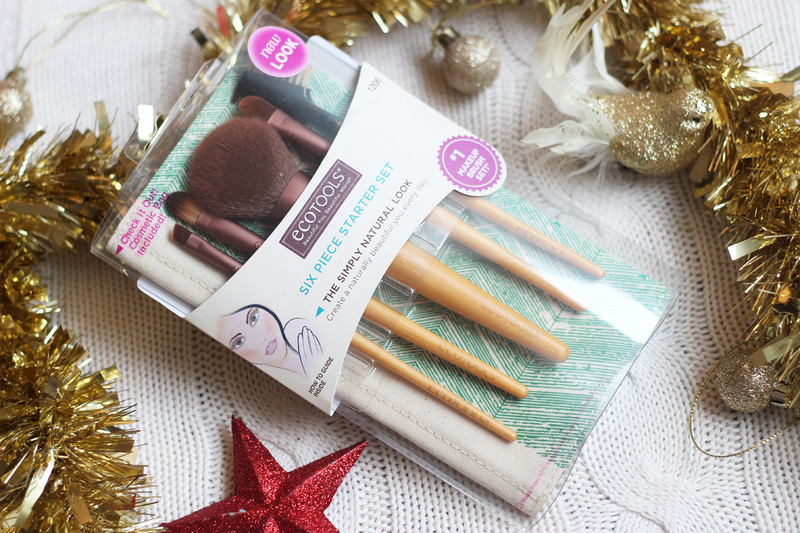 This Ecotoo1s 6 Piece Starter Set* is only £14.99) and it comes with a nice little pouch for storing the brushes and a selection of tools. All made from soft, cruelty-free bristles, featuring recycled aluminium ferrules and sleek bamboo handles. 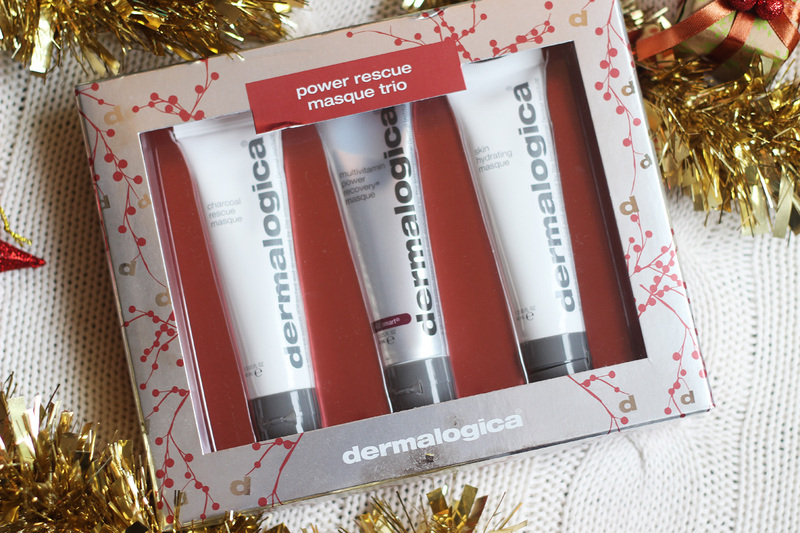 Dermalogica have this Power Rescue Mask Trio*(£43.25) in their Christmas collection and it is a great way to try their masks, without committing to buying full size. The set contains: a Charcoal Rescue Masque (38ml), MultiVitamin Power Recovery® Masque (38ml) and a Skin Hydrating Masque (38ml). Can't wait to give these a go during the festive season. 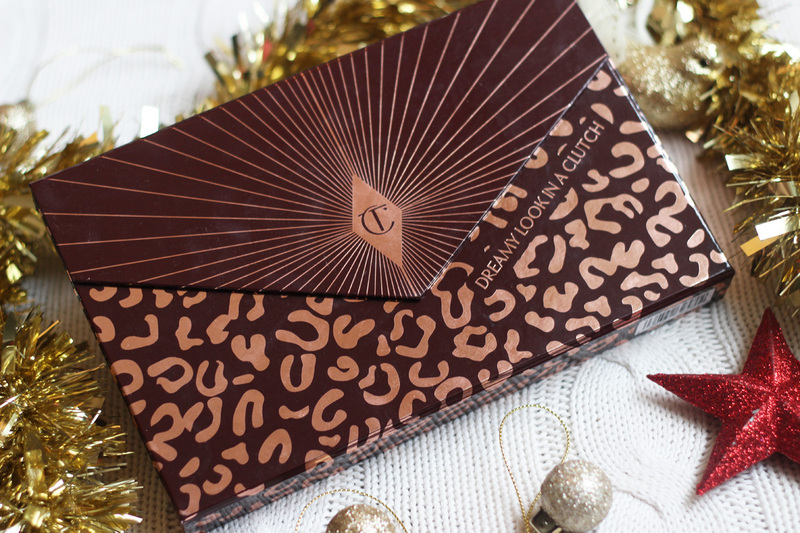 And how lovely is the packaging? 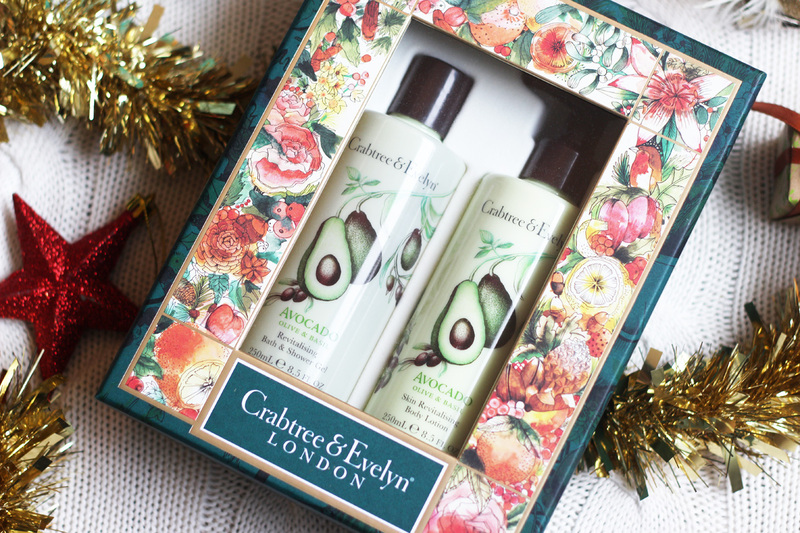 Crabtree & Evelyn always have a massive selection of gifts for Christmas and this Avocado, Olive & Basil Duo* is just lovely. I can't seem to find it online anymore, but you can buy the Shower Gel and Body Lotion separately as well and there's many other amazing sets on their website too. They even do biscuits and tea - which are incredible by the way! Again, I can't find this gift set anywhere, but you can buy these fantastic Antipodes products separately and you won't regret it. The Manuka Honey Skin Brightening Light Day Cream*(£39.99) is such a treat for the skin! It is light, but ultra hydrating and it smells so beautiful! The Manuka Honey Skin Brightening Eye Cream*(£35.99) is also incredible and it would make a lovely gift for anyone. 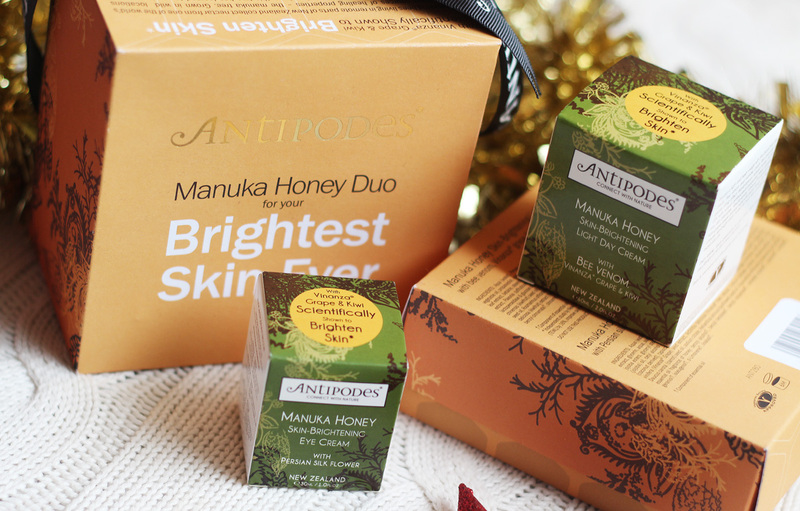 My husband is actually a big fan of Antipodes skincare, so I would definitely recommend it as a great unisex option. Another lovely natural brand I am always happy to feature in my gift guides is Bee Good. Their Clean Sweep Duo*(£11.50) is a very affordable and beautifully packaged gift set, featuring a 100ml Honey & Wild Water Mint 3-in-1 Cleansing Water and a 10ml Raspberry & White Chocolate Lip Balm- which smells divine by the way. Dirty Works always surprise me with some fab treats. Great prices and lovely quirky packaging are an added bonus! The Get Set Glow The Full Works*(£6.00) contains 4 minis of their bath and body products and the little Beauty Stack*(£4.00) comes with some bath caviar, a bath fizzer and a body butter. 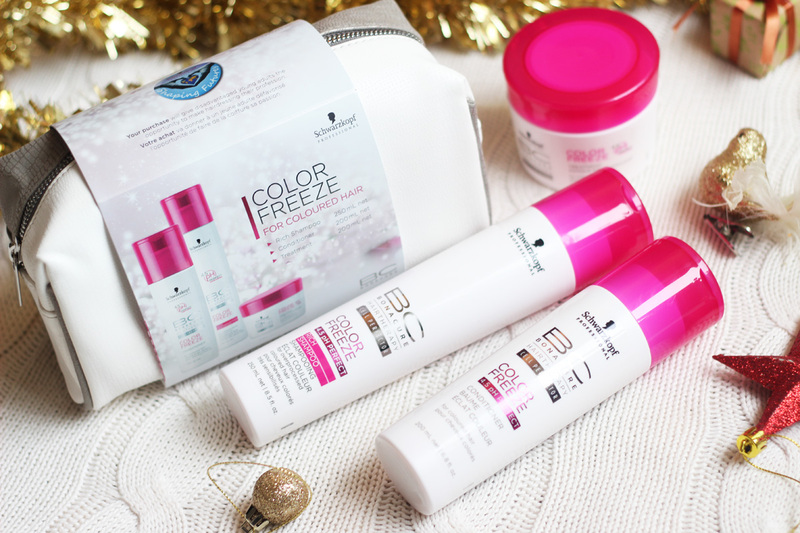 I received this Schwarzkopf Color Freeze Set* at a Rainbow Room International Event I attended a few weeks ago, so I thought I would feature it, just in case you're near one of their salons in Glasgow. I went to the one in Royal Exchange Square and got my nails and hair done, which you might have seen on my instagram. Lovely salon and great staff. They have some fantastic treatment available, including gel manicures, pedicures, hd brows, makeup, spray tans, a huge selection of spa treatments (massages, facials etc) and even floatation tanks! 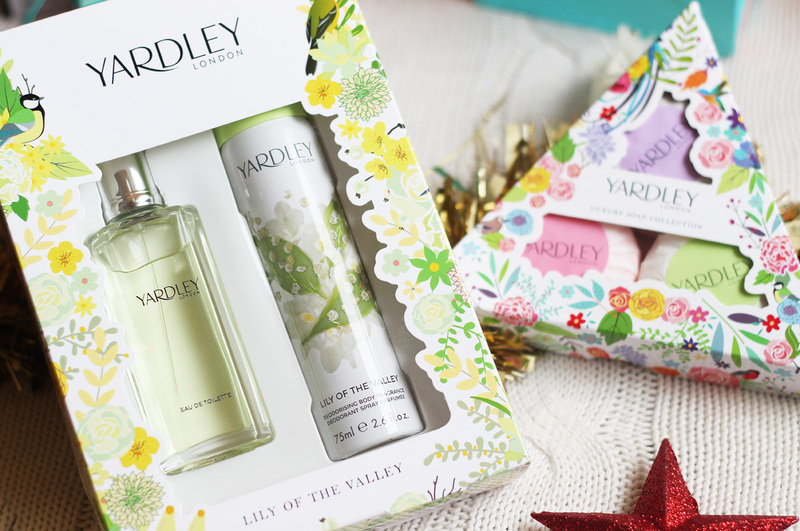 Back to the gift sets I can actually find online, we have the Yardley Lily Of The Valley Duo(£10.00). Lily of the Valley is a light, feminine white floral fragrance with fruit pear accords in the top note, a heart of lily of the valley and freesia and a musky base. It includes a 50ml EDT and & 75ml Body Fragrance. Their little soaps are amazing by the way and this Luxury Soap Trio*(£6.00) would make a fab gift for anyone who likes a scented soap (my grandmums loooove them!). The trio includes English Lavender, English Rose and Lily of the Valley. And they are so nicely wrapped too! Perfect! 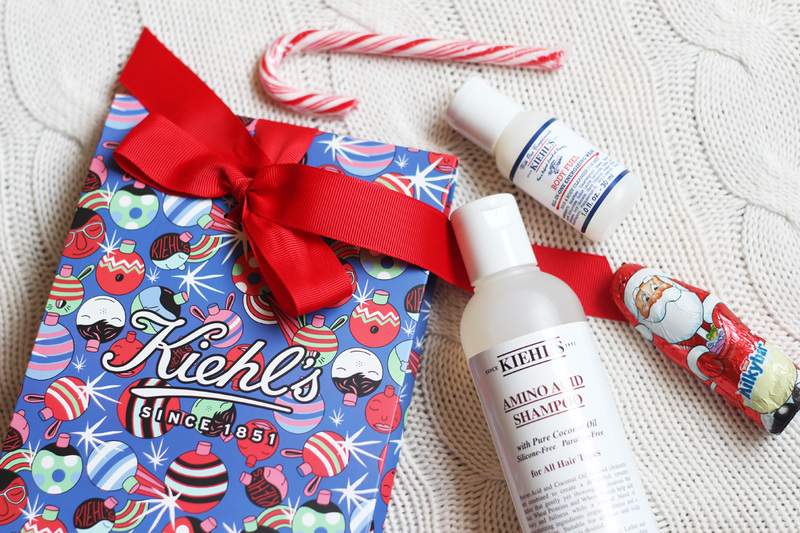 Another little set I received at an event was this lovely selection of Kiehl's goodies, which contains their Amino Acid Shampoo & a mini All In 1 Energising Wash. 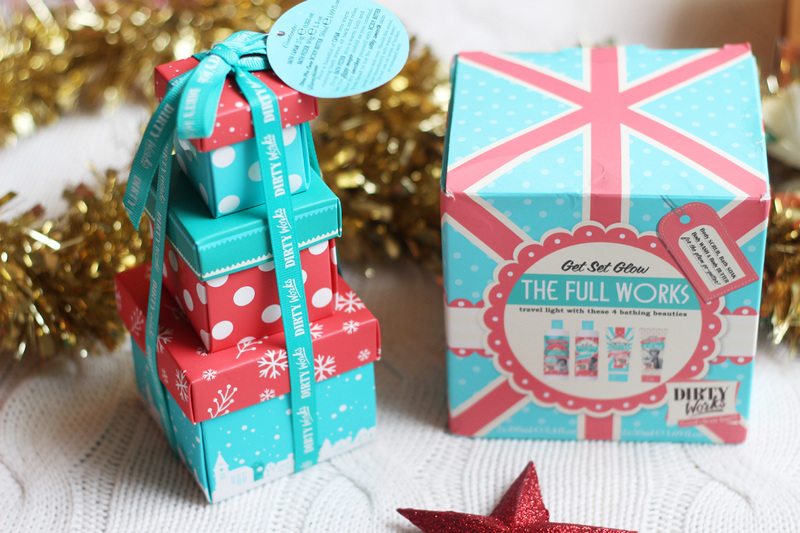 I thought I should mention them int he gift guide, as their Christmas packaging looks amazing! To see their Christmas offerings, visit one of their stores or their gift shop online HERE. You can mix and match and they will wrap it for you for free! 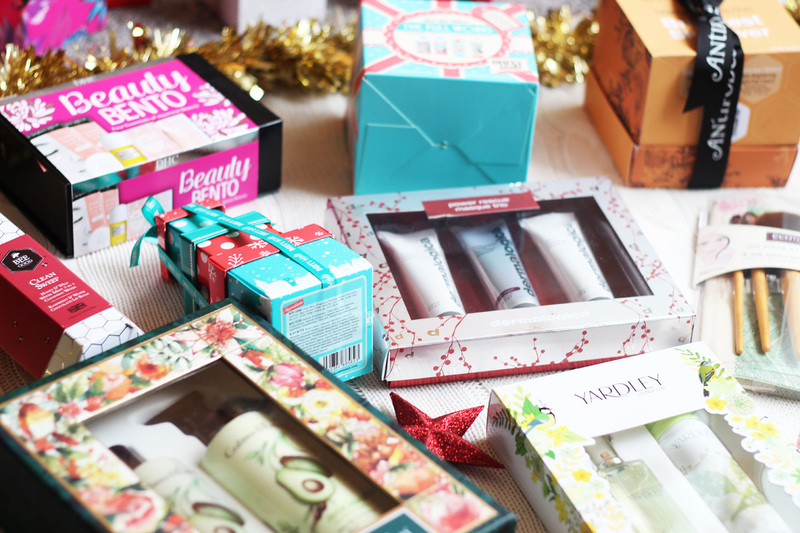 Keep your eyes peeled for a stocking filler gift guide tomorrow.